Today was the second annual Oakland Book Festival. I couldn't make last year's, but this year's was great—lots of people turned out to learn about and talk about books and their impact on society, but mostly to celebrate books. I was particularly interested in the session on Jack London, "The 100 Year Call of the Wild". 2016 marks 100 years since Jack London's death (and only 140 years since his birth; he died at 40). The panelists included Tarnel Abbott, great-granddaughter of Jack London, and a political activist in her own right; Iris Jamahl Dunkle, Poet Laureate of Sonoma County, college professor, and author of an upcoming biography on Jack's second wife, Charmian Kittredge London; Steven Lavoie, historian, poet, and librarian, currently in charge of the Temescal branch; Jay Williams, founding publisher and editor of the Jack London Journal, and author. The moderator was Jack Boulware, co-founder of Litquake. Kudos to the moderator, Jack Boulware. You could do a whole conference on Jack London and his writing, so to keep things moving in the hour and 15 minutes available was quite a feat. Given the constraints, I'm sure everyone who attended wishes some aspect could have gotten more time, but there was one clear takeaway, even for those relatively new to Jack London: Jack was a complex and imperfect person; his writing and his beliefs were complicated, and evolved over time. To try to answer any question about him with a simple answer is to disregard the facts. I'm guessing any of the other sessions were at least as interesting; I know for myself, I wish I'd had the time and energy to check out pretty much everything at the festival. But shoutouts to Nia King, Luan Stauss, and Brad Johnson for representing Oakland! On Saturday, local historian and author Dennis Evanosky led Oakland Urban Paths on a hike through Sibley Regional Volcanic Preserve. It was quite a bit less urban than our regular walks; there were no stairs, no streets to cross, and instead of worrying about traffic, our biggest concerns were poison oak and cow pies. Dennis told us some about the geology of the area. The peak, Round Top, is an ancient volcano. It sits between two faults, the Hayward Fault to the west, and the Calaveras Fault to the east. Over time, the volcano was tipped on its side. Much of this wouldn't be visible, except Kaiser Sand and Gravel quarried in the area for basalt, and resulting digs exposed more of the underlying geology. At the bottom of several former quarries, labyrinths have been constructed. Unlike mazes, which have any number of false routes and dead ends, a labyrinth has a single path from the outside to the center. The size is usually measured by the number of turns, i.e., how many times the path doubles back. Walking a labyrinth can be an act of meditation; I would guess constructing one could be, too. Along with geology, there were lots of wildflowers to look at, and a variety of birds, including crows, a red-tailed hawk, and in the distance, a turkey. Our final stop gave us a view of another ancient volcano, Vollmer Peak (formerly known as Bald Peak) in Berkeley, the Caldecott Tunnel, and the site of the eastern end of the former Kennedy Tunnel. 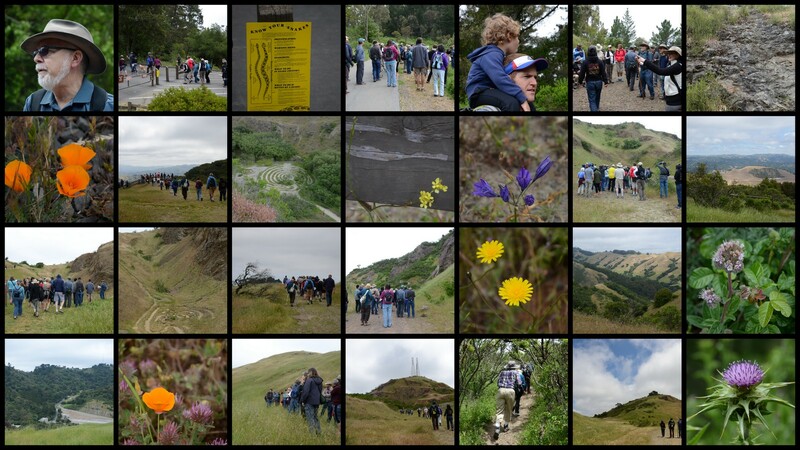 A great hike—many thanks to Dennis for leading it, and to the 45 or so folks who came out to participate. The next regular OUP walk will be Saturday, June 11th, but we haven't decided which walk we'll do. On Saturday, June 4th, there will be a special walk in the Golden Gate neighborhood as part of Love Our Neighborhood Day. Note the different start time. Today marks the 164th anniversary of Oakland being incorporated as a town. This was something of a surprise to the residents of what had been the village of Contra Costa, but that was never the kind of thing to slow down Horace Carpentier. He went on to become Oakland's first mayor, winning by more votes than there were voters. In honor of Oakland's birthday, I'm releasing a new feature here on Our Oakland, "Today in Oakland history...". It appears in the upper right, and will show you a list of events of significance from that day in Oakland history. In most cases the entries are links to the Oakland Wiki, where you can find out more about the event or person in question. I haven't found events for every day yet, but it's a good start.